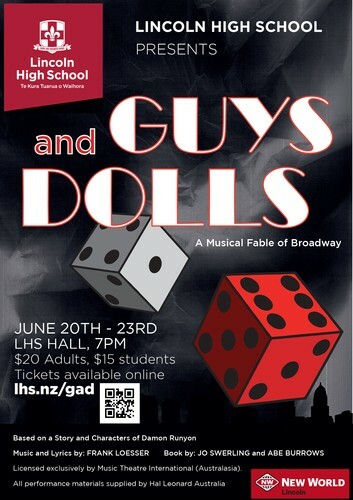 Lincoln High school students present the musical Guys and Dolls. Set in Depression-era Times Square, Guys and Dolls is about a couple of big city gamblers and the women who love them. It tells the overlapping stories of high-roller Sky Masterson, who falls in love with mission worker Sarah Brown, and lovable rapscallion Nathan Detroit, engaged for 14 years to Miss Adelaide, a headliner at the Hot Box Club. Nathan runs a famous floating crap game, and an ongoing plot line involves his quest for a safe place for the game as Adelaide continues her quest to convince him to marry her. Meanwhile, Sarah, mistakenly believing that Sky set up an illegal game at the mission, tries to fight her affection for the charismatic crapshooter.